A major line of defense must be the various sections of the airports, which, as a gateway to the outside world and transportation hub of the city, has always been on the top of the safety list of the government and all related authorities. Dahua’s Airport Solution is an intelligent security system to help ensure the safety of the airports. Designed to solve all the difficulties mentioned above, Dahua’s Airport Solution is a unified security system combining multifunctional HD surveillance cameras with deep-learning AI that can analyze the big data to get the target, be it a car, a face or a series of numbers. In terms of vehicle management: you can adopt all-in-one cameras to capture and recognize license plates of vehicles accessing the airport. This will trigger the alarm when detecting illegal, stolen, blacklisted, hit-and-run, crime-related and other suspects’ vehicles. The intelligent analysis of IVS (intelligent video system) requires 10 x 10 pixels, under which condition, each thermal imaging camera can detect and analyze objects from within 400m. There is in total 12km of perimeter length in need of such cameras, so Dahua chose to place 30 there, totalling 40 thermal imaging cameras to solve the problem. It should be noted that Dahua’s thermal imaging technology has the following advantages: PTZ function, long distance surveillance (which can detect a vehicle 8.8 km away), long distance zoom, binocular lens (optical and thermal imaging lens), and strong intelligence (which can detect intrusion). 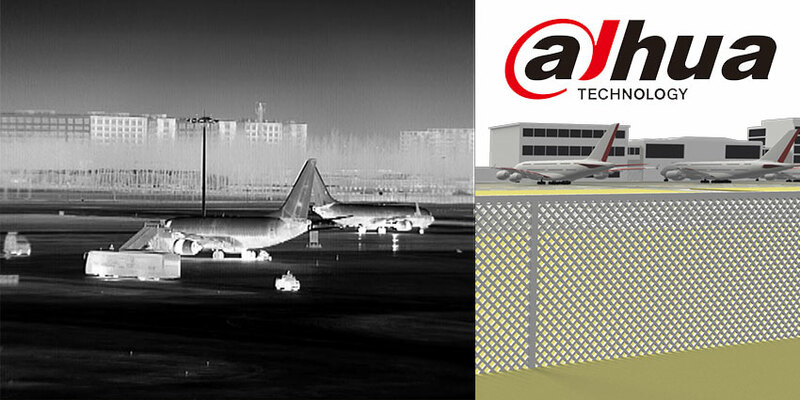 Compared to alternate perimeter protection equipment on the market today, such as vibration fiber sensor and IR beam sensor, thermal imaging camera has higher accuracy and less false alarm while directly providing video to verify.